Citation: Puri N (2015) Comparative Study of 70% Glycolic Acid Versus 35% TCA Versus 1% Tretinoin Peel for the Treatment of Melasma. Skin Dis Skin Care 1:1. Copyright: © 2016 Neerja Puri. This is an open-access article distributed under the terms of the Creative Commons Attribution License, which permits unrestricted use, distribution, and reproduction in any medium, provided the original author and source are credited. Introduction: Chemical peels are used in melasma to create an injury of a specific skin depth with the goal of stimulating new skin growth and improving surface texture and appearance. The exfoliative effect of chemical peels stimulates new epidermal growth and collagen with more evenly distributed melanin. Aims: The aim of our study was to compare the efficacy and side effects of 70% glycolic acid versus 35% TCA versus 1% tretinoin peel for the treatment of melama in sixty Indian female patients. Methods: We selected 60 female patients of melasma for the study. The patients were divided into three groups of 20 patients each. In Group I patients 70% Glycolic acid peel was used, in Group II patients 35% TCA peel was used and in Group III patients 1% tretinoin peel was used. Abbreviations: Results In group I (Glycolic acid group) patients, 65% reduction of MASI score was seen, in group II (TCA group) 59% reduction of MASI score was seen, whereas in group III (Tretinoin group) patients 50% reduction in MASI score was seen. Subjective response, as graded by the patient, showed good or very good response in 70% in GA group and 60% in TCA group and 50% in the tretinoin group. Conclusions: Considerable reduction of MASI scores was achieved in all the three groups with variable side effects with all the three peels. Melasma; Hypermelanosis; Epidermis; Dermis; Glycolic acid peel; TCA peel; Tretinoin peel. Melasma is an irregular brown or grayish-brown facial hypermelanosis, often affecting women, especially those living in areas of intense UV radiation [1-3]. The precise cause of melasma remains unknown; however, there are many possible contributing factors. Melasma is sometimes used interchangeably with the term ‘‘chloasma,’’ which is a hyperpigmentation that often results from pregnancy or changes in uterine and ovarian hormones; melasma, however, can have a variety of possible causes. The common contributing factors include genetic predisposition, pregnancy, use of oral contraceptives, endocrine dysfunction or hormone treatments and exposure to UV light. Generally, melasma is classified into one of 3 histologic types: epidermal, dermal, and mixed. However, some also include a fourth type known as Wood’s light inapparent. Under Wood’s light the epidermal type often shows a darkening of color when examined, as the light emitted by Wood’s lamp is absorbed by the excess melanin. The dermal type, however, will not show this accentuation. The mixed type involves a deposition of melanin in both the epidermis and the dermis and color enhancement with Wood’s light is seen is some places of the skin, but not others . There are 3 clinical patterns recognized on the basis of clinical examination. These include a centrofacial, malar, and mandibular pattern. The centrofacial is the most common pattern of melasma and involves the cheeks, forehead, upper lip, nose, and chin. The malar pattern has lesions limited to the cheeks and nose, and the mandibular pattern has lesions that occur over the ramus of the mandible . The aim of our study was to compare the efficacy and side effects of 70% glycolic acid versus 35% TCA versus 1% tretinoin peel for the treatment of melama in sixty Indian female patients. We selected 60 female patients of melasma for the study. Written informed consent was taken from all the patients for the study. Prior permission of hospital ethical committee was taken before the start of the study. The patients were divided into three groups of 20 patients each. In Group I patients 70% Glycolic acid peel was used, in Group II patients 35% TCA peel was used and in Group III patients 1% tretinoin peel was used. Both glycolic acid and TCA peels were used for a period of 3 minutes only whereas the tretinoin peel was left on the skin of the patient for 4 hrs without disruption. Woods lamp examination was done in all the patients to see the type of melasma. MASI scoring of the patients was done every 2 weeks till 12 weeks. Follow up of the patients was done for a period of 6 months. To calculate MASI, the face was divided into four regions [forehead (F) 30%; right malar (MR) 30%; left malar (ML) 30%, chin (C) 10%] and each area was given a numerical value (A, 0-6). The sum of severity for darkness (D, 0-4) and homogeneity (H, 0-4) of melasma was multiplied by the numerical value and percentage of each area. These values were then added to obtain MASI by a singleblinded trained dermatologist. For, subjective improvement before and at the completion of the study, the response in each patient was graded as: no response if there was no change in MASI score at the end of three peels; mild response if there was less than 25% change; moderate response with 25 to <50% decrease in MASI; good response if there was 50 to <75% fall in MASI score; very good response with more than 75% fall in MASI score. • Patients with epidermal melisma. • Patients with realistic expectations. • Patients with a history of herpes. • Patients taking oral contraceptive pills. • Pregnant and lactating females. • Patients with history of keloids or hypertrophic scars. Priming of the patients was done 2 weeks prior to the peel with 12% Glycolic acid cream in Group I patients and with 0.1% tretinoin cream in Group II and III patients. The data was tabulated and statistically analyzed using student's paired t-test (Tables 1-3). Table 1: Table showing age distribution of patients. Table 2: Table showing Masi score before and after treatment. Table 3: Table showing side effects of peels. In our study, commonest age group (50%) patients were in the age group of 10-20 years, 30% patients were between 21–30 years of age and 10% patients each were in the age group of 31–40 years and 41–50 years respectively. The most common pattern was malar (70%) followed by centrofacial pattern (30%). 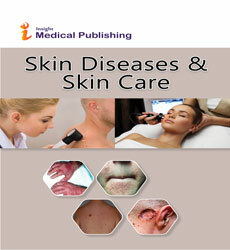 Duration of melasma ranged between 1 and 8 years with a mean of 3.8 ± 4.3 years. There was no statistically significant difference in reduction of MASI scores at the end of six peels after 12 weeks in all the three groups (P>0.05). 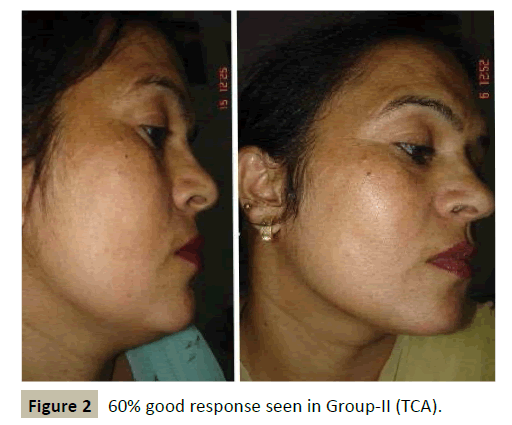 Subjective response, as graded by the patient, showed good or very good response in 70% in GA (Figure 1) group and 60% in TCA (Figure 2) group and 50% in the tretinoin (Figure 3) group. In group I (Glycolic acid group) patients, 65% reduction of MASI score was seen, in group II (TCA group) 59% reduction of MASI score was seen, whereas in group III (Tretinoin group) patients 50% reduction in MASI score was seen. But the comparative efficacy in all the three groups was statistically insignificant. Relapse was seen in only one case after a follow up of 6 months in GA group, 3 patients in TCA group and 1 patient in the tretinoin group. Regarding side effects of peels, erythema was seen in 3 patients in TCA group and 1 patient each from glycolic acid group and tretinoin group. Itching was seen in 3 patients in TCA group, 2 patients in glycolic acid group and in 1 patient with tretinoin peel. Postpeel crackening was seen only in 2 patients in the TCA group andwas not seen in any other group. Post inflammatory hyperpigmentation was seen in 2 patients with TCA peel and in none of the other two groups. Postpeel crackening effect that occurred only with TCA and not with GA makes it beneficial for patients to continue outdoor activities and office work in GA group. 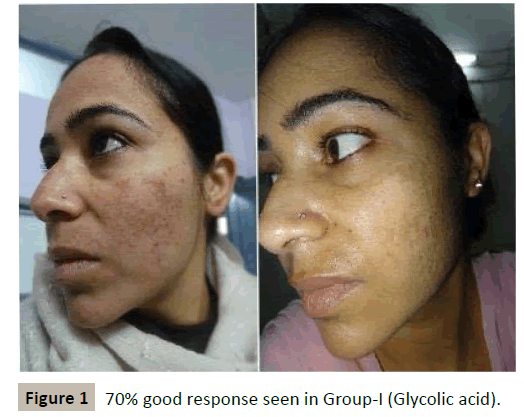 Figure 1: 70% good response seen in Group-I (Glycolic acid). Figure 2: 60% good response seen in Group-II (TCA). 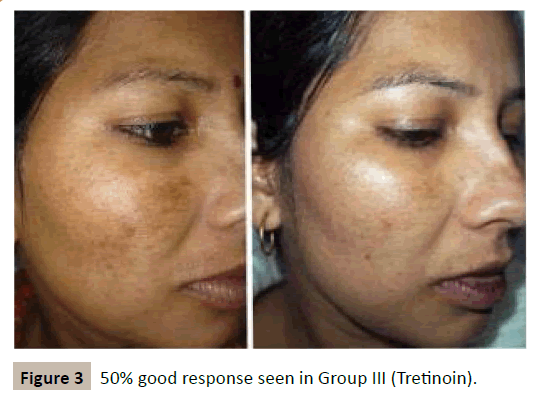 Figure 3: 50% good response seen in Group III (Tretinoin). Because of its refractory and recurrent nature, melasma is often difficult to treat. The goals of treatment often include prevention or reduction in the severity of recurrence, reduction of the affected area, improvement in the cosmetic defect, and reduced time to clearance, all with the fewest possible side effects [5,6]. The mechanism of action of chemical peeling agents is the removal of melanin. In darker races, the choice of the peeling agent becomes relatively limited; so, there is the need for priming agents and additional maintenance peels . Glycolic acid is the most commonly used peels in the treatment of melasma with concentrations varying from 35% to 70% [8,9]. Although a commonly used peel in lighter skin, trichloroacetic acid (TCA) peel is less frequently preferred in darker skin types due to the risk of scarring and post-peel dyschromias . This is probably because frosting, the end point for a TCA peel, is not well appreciated in darker skin, and hence can lead to overtreatment . When used, only a low concentration of TCA (10-35%) is preferred which reaches upto the upper papillary dermis, and hence TCA peels are not appropriate for treating dermal and mixed forms of melasma. Topical retinoic acid applied daily to the skin produces modifications in the epidermis and dispersion of melanin . It is possible that tretinoin peeling, which is ranked as a superficial peel8 induces the same modifications with the advantage of being a more rapid and practical treatment for patients with melasma. The mechanism of action of tretinoin peels is proposed to be similar to that of topical tretinoin, that is, via changes in the epidermis and dispersion of melanin. The first successful use of tretinoin peel for melasma was done by Cuce et al. in fairskined patients. Following this, a pilot study was carried out in dark-skinned patients by Khunger et al. . Who compared 1% tretinoin peel with a standard 70% GA peel. Ten female patients of melasma were taken up for an open left–right comparison study of 12 weeks. One percent tretinoin peel was applied on one-half of the face, whereas 70% GA was applied on the other. A significant decrease in the modified MASI from baseline to 12 weeks was observed on both facial sides (P<0.001). Nevertheless, there was no statistically significant difference between the right and left sides. The study concluded that serial 1% tretinoin peel is as effective a therapy for melasma as chemical peeling with 70% GA. In an Indian study carried out by Kalla et al. GA and TCA showed comparable results on subjective scores given by patients. The rate of hyperpigmentation and relapse was higher in the TCA group (25%) than GA group. In a comparative study on 40 Indian women by Kumari et al. the overall fall in MASI after six TCA peels was comparable to that observed with a similar number of 10-35% GA peels. However, the TCA group complained of more severe burning as compared to GA; post-peel crackening was seen in 35% patients in the TCA group and none in the GA group. To conclude, 70% glycolic acid is the gold standard in the treatment of melasma. Regarding the 35% TCA peel, it was found that the efficacy of the TCA peel was comparable with 70% glycolic acid peel, but the side effects especially post peel grackening and post inflammatory hyperpigmentation were more with the TCA peel. Also it was seen that the downtime in the glycolic acid peel was much less as compared to the TCA peel with the patients getting back to their work place much earlier as compared to the TCA peel.1% tretinoin peel was found to be a good option in patients having sensitive skin as tretinoin peel was found to be less irritating and better tolerated as compared to the other two peels. The only disadvantage of the tretinoin peel was that it had to be left on the face for four hours undisturbed which caused a yellow face which was not always acceptable to some patients. Grimes PE (1995)Melasma: etiologic and therapeutic consideration. Arch Dermatol131: 1453-1457. Pandya AG, Guevara IL (2000) Disorders of hyperpigmentation. Dermatol Clinics 18:91-98. Sheth VM, Pandya AG (2011)Melasma: A comprehensive update: Part II J Am AcadDermatol65: 699-714. Sanchez NP, Pathak MA, Sato S, Fitzpatrick TB, Sanchez JL,et al. (1981)Melasma: a clinical, light microscopic, ultrastructural, and immunofluorescence study. J Am AcadDermatol 4:698-710. Azzam OA, Leheta TM, Nagui NA, Shaarawy E, Abdel Hay RM, et al. (2009) Different therapeutic modalities for treatment of melasma. J CosmetDermatol 8:275-281. Nordlund JJ, Boissy RE, Hearing VJ, King RA, Ortonne JP (2007) Mixed epidermal and dermal hypermelanoses. The pigmentary system physiology and pathology. New York: Oxford University Press 909-13. Kalla G, Garg A, Kachhawa D (2001) Chemical peeling-glycolic acid versus trichloroacetic acid in melasma. Indian J DermatolVenereolLeprol67: 82-84. Grover C, Reddu BS(2003) The therapeutic value of glycolic acid peels in dermatology. Indian J DermatolVenereolLeprol 69:148-150. Ditre CM (2000) Glycolic acid peels. DermatolTher13: 165-72. Nguyen TH, Rooney JA(2000) Trichloroacetic acid peels. DermatolTher13:173. Cuce LC, Bertino MC, Scattone L, Birkenhauer MC (2001)Tretinoin peeling. DermatolSurg 27:12-14. Khunger N, Sarkar R, Jain RK (2004)Tretinoin peels versus glycolic acid peels in the treatment of Melasma in dark-skinned patients. DermatolSurg30:756-760. Kumari R, Thappa DM (2010) Comparative study of trichloroacetic acid versus glycolic acid chemical peels in the treatment of melasma. Indian J DermatolVenereolLeprol76:447.